KALLISTA, a leading designer and provider of luxury kitchen and bath products has announced that it is the recipient of the KBIS 2018 awards for Best in Show and Best of Bath: Gold categories for its Grid by KALLISTA faucet design, part of the Grid Collection. The annual competition provides exhibitors an opportunity to showcase their best kitchen and bath designs. Five design professionals judge the competition and winners are selected based upon functionality, quality and durability, flexibility, aesthetics and style, and innovation. 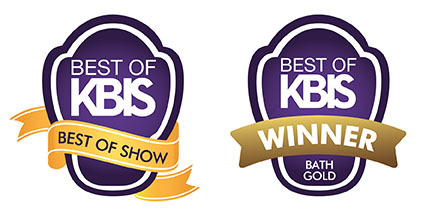 The Best of KBIS award has five categories: Best in Show, Best of Kitchen: Gold; Best of Kitchen: Silver; Best of Bath: Gold; and, Best of Bath: Silver. 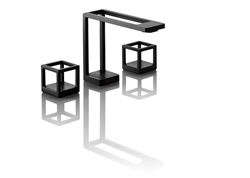 KALLISTA took top honors with its submission of the Grid sink faucet and Cube handles. The Grid Collection by KALLISTA pays homage to architects, designers, and artists that stepped away from 19th century design norms setting off an artistic revolution that literally took the world by storm. It was this shift from ornamentation and pomp to spare, restrained form that began a new genre in design – one that continued to grow throughout the mid-20th century and remains one of the most significant chapters in the history of design. The collection is comprised of a sink faucet executed using 3D printing technology, wall-hung console, lighting and accessories. The Grid Collection will be available beginning in Summer 2018. To create the Grid faucet, KALLISTA partnered with Indianapolis-based 3rd Dimension, a 3D printing specialist and high quality production metal manufacturer specializing in 3D direct metal printing by employing 3D Systems technology. Through this collaboration, KALLISTA was able to recreate Grid’s intricate form and also meet the exacting standards and required timely execution to compete and meet industry demands. The KALLISTA Grid sink faucet is the very first of its kind within the vast Kohler family of businesses’ product portfolio. The faucet employs 3D printing, resulting in Grid’s unique design elements, which defy the standard requirements of external housing to incorporate internal components. The form is developed through a layer-by-layer process of powdered steel that is then laser fired to liquid and cooled before another layer is added until the form is complete. Through 3D printing, KALLISTA can achieve the Grid sink faucet’s open form and discreet interior channels that allow the water to flow easily through the base. The Grid sink faucet comes standard with the KALLISTA soft touch drain, is fitted with quarter-turn washerless ceramic disc valves for seamless operation, and provides an environmentally sound 1.2 gallon minimum/maximum water flow rate. This boutique collection resonates with tailored elegance and harnesses the visual impact negative space can command by stripping away the confines of traditional design elements to expose the intrinsic beauty of simple, geometric form. Grid has become the latest star within the KALLISTA portfolio, pushing the boundaries of cutting-edge bath design. 3D Systems provides comprehensive 3D products and services, including 3D printers, print materials, on demand manufacturing services and digital design tools. Its ecosystem supports advanced applications from the product design shop to the factory floor to the operating room. 3D Systems’ precision healthcare capabilities include simulation, Virtual Surgical Planning, and printing of medical and dental devices as well as patient-specific surgical instruments. As the originator of 3D printing and a shaper of future 3D solutions, 3D Systems has spent its 30-year history enabling professionals and companies to optimize their designs, transform their workflows, bring innovative products to market and drive new business models. More information on the company is available at http://www.3dsystems.com. KALLISTA is known for its designs of luxury plumbing products, offering faucets and fixtures thoughtfully created for tasteful, whole-bath solutions. KALLISTA is available in fine showrooms in major cities throughout the world. Kallista, along with sister brands Ann Sacks Tile and Stone, Inc., and Robern mirrored cabinetry and vanities, is a division of the Kohler Co. Decorative Products Group, a wholly owned subsidiary of Kohler Co.
For additional information regarding the Grid Collection and other KALLISTA products, consumers can visit http://www.kallista.com.